– Fort Worth city council unanimously endorsed the Bike Fort Worth plan, which will bring 900 miles worth of trails and bike lanes to the city. Hundreds turned out in support and the newest Bike Friendly group launched their inaugural group ride leading to City Hall. 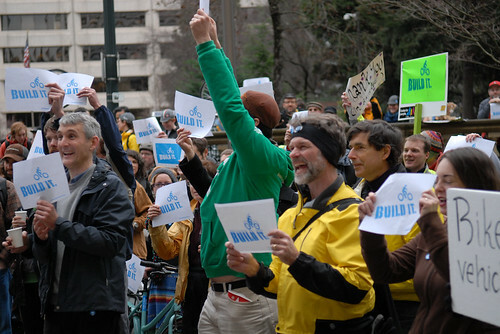 – Portland’s city council unanimously adopted an ambitious 500+ Million dollar plan to develop 700 miles of bicycle infrastructure, with over 300 miles built as dedicated European styled cycle-tracks. The city initially invested 2% of its transportation funds to bicycling in the 90’s, and have seen ridership increase to some of the highest in the US due to this commitment. This latest move will vault the area to the ranks of the greatest bike cities in the world. – Times Square in New York City will permanently remain car-free. Those who have been following the story on Times Square amazing genesis from a sea of yellow cabs and gridlock to a people-first plaza, may not have realized that the plan was an 8 month pilot project to test the waters of removing automobiles from the “crossroads of the world”. The results showed a dramatic decrease in pedestrian injuries, even as more people walked to the area. As we noted in the past, including bicycle infrastructure has shown major decreases in accidents of all three transit types (bike/ped/auto). The reason planners have noted this is due to the fact that roads are being thinned, cars are having to slow their speeds, while more people are attracted to walking and bicycling, which in turn increases ridership levels thereby supporting the “Safety in Numbers” trends found throughout the world. Alright Dallas…the gauntlets been laid. ← Reminder: Bike Friendly Fort Worth City Hall Ride Tonight!